We are The Charlottesville Society of Human Resource Management, an affiliate of the Society for Human Resource Management (SHRM). Our chapter was chartered in 1959 and is one of the oldest in the country! Our mission is to engage our members, advance the profession, and provide leadership in the community through sharing and promoting best practices in human resource management. Whether you want to advance your career, earn and maintain professional certification, share ideas and best practices, help prepare the next generation of HR professionals, or learn and network at our monthly membership meetings, now is a great time to get involved with Charlottesville SHRM! 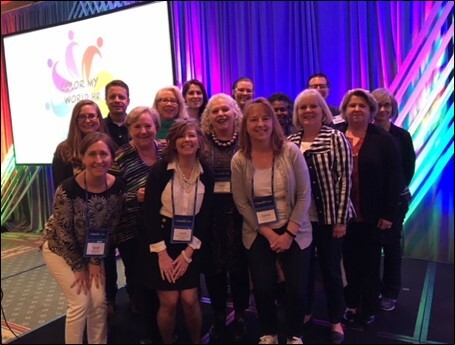 and a 2016 SHRM Learning System Champion! Chapter members enjoy many great benefits, like monthly meetings offering professional development experiences and opportunities to network with local HR professionals; an AnnualConference providing fantastic learning opportunities;easy and affordable ways to earn HRCI and SHRM professional certification credit; aCertification Study Group to help you earn your SHRM-CP or SHRM-SCP credentials; Members-only resources like our chapter directory, podcasts, past meeting materials, and much more. Sponsoring a Charlottesville SHRM event is the most effective way to promote your organization to Human Resource professionals in the Charlottesville area! Cville SHRM boasts nearly 200 members from organizations employing 108,000+ employees. Sponsors can speak and distribute materials at our membership meetings, receive exposure on our website and are invited to attend our annual holiday social in December. Sponsoring our annual conference held in September is another great way to reach local HR professionals.